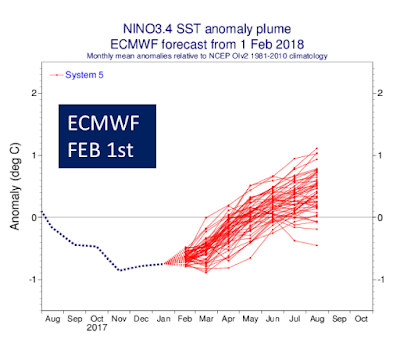 Act II: Knocking on the Door; El Nino for 2018/2019? Act II of our winter storm is knocking on the door and should be affecting most of the Tahoe area by late this afternoon. This storm is coming from the north and is colder than Act I. Where Act I weakened, Act II has strengthened and slowed down. 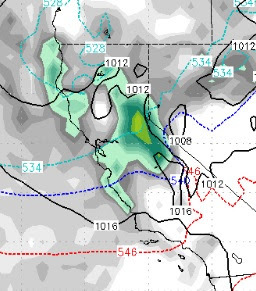 The Carson Range should pick up 2-4 feet of snow tonight and tomorrow above 8,000 feet. This storm is much colder and will be all snow for all areas. Some ares of the western crest of the Sierra will pick up as much as 5 feet of snow. There is a shadow effect to this storm, but we still like our chances of getting a major dump. This storm approaches from the southwest and brings tropical moisture with it. 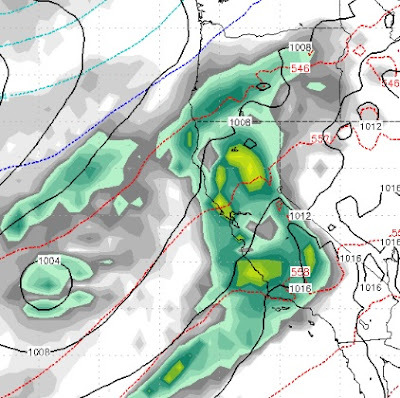 That mean lots of precip for the entire state of California. It also means very high snow levels, perhaps as high as 10,000 feet to start. This could be the last in our series of storms as a ridge of high pressure moves in right behind this storm. With that ridge we are seeing some very warm temperatures, possibly in the 70's or above for late next week. We will keep an eye on both of these developing weather systems and report accordingly. As far as very long range, is it too early to talk about next winter? We are in a transitional period from La Nina (responsible for our dry beginning of the winter), to El Nino (somewhat unpredictable but usually means above average precip). Some models have us in a strong El Nino for next winter, which bodes well for a very snowy 2018/2019. Above is the European model forecast back in February. Since that time, this forecast has been backed up by several other models. It looks like El Nino is on it's way and should be with us for at least the beginning of the next winter season. This could also point to more thunderstorms and weather systems this summer for our area. Finally, do not be fooled by our wet spring. People from other parts of the country simply do not understand the concept that we have a dry and rainy season here. The eastern two thirds of the country, has a much more uniform precip schedule. Here, the dry season means no rain or at least very little rain. With all this moisture we can expect a very green spring and early summer. However, as we transition into the dry season that green will turn to brown and provide tinder for fires, similar to what we saw late last summer. Wet winters mean big fire seasons. Hopefully another big snow year! When is our Next Big Storm?